As I sit in the World Vision Solomon Islands office with a room full of pastors, moisture lingers in the air, forming sweat beads on my brow. The air conditioner is on, but my body isn’t responding just yet. Everyone thinks for a moment before taking sides. Once decisions have been made, discussion begins. One pastor pipes up in defence of physical discipline. He reasons: When Jesus said “turn the other cheek” what he meant was that it’s OK to slap someone with the back of your hand as a form of discipline, but when you punch them in the other direction, it becomes violence, and that’s not OK.
It’s my first taste of what is an endemic problem in the Solomon Islands and the Pacific region more broadly. Seen as culturally acceptable, violence against women is prevalent right across the region, and sadly, the church is complicit, often perpetuating the problem through false teaching. A landmark study published in 2009 found that 64 per cent of women in the Solomons had suffered physical or sexual violence, or both, from an intimate partner. And this is in a country where 97 per cent of the population identifies as Christian. Hoping to tackle distorted views of gender, World Vision established the Channels of Hope for Gender programme in the Solomons three years ago. Run across a number of days, the programme begins by examining existing cultural misunderstandings, and then moves to re-educate pastors using Bible passages like Genesis 1:27 to establish values like equality of status before God, and a husband’s duty of care for his wife (Col 3:19). Seen as culturally acceptable, violence against women is prevalent right across the region, and sadly, the church is complicit, often perpetuating the problem through false teaching. The Australian Government has partnered with World Vision to fund the programme which has now been run in a number of villages, as well as within the Solomon Islands police force. What makes this all the more remarkable is that Channels of Hope is a Bible-based programme. The Australian Government, no doubt, has realised that faith leaders are the most influential people in Solomons culture, and the way to see change is to leverage the faith the majority of Islanders profess. During my week in the Solomons I see people of great beauty, with enormous hearts and a contagious passion for God. But I also see poverty and a country where subjugation of women is normalised. 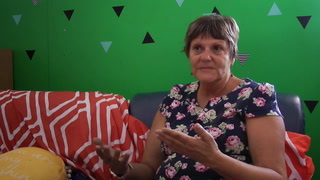 Sister Christina from the Christian Care Centre for abused women and children in Honiara. One afternoon we’re driven down a dirt road through thick vegetation. None of us know where we’re going, only that we’re visiting a refuge for women and children who’ve been abused. Stepping out of the minibus we’re struck by the beauty of the nearby ocean, lap-ping at the shoreline dotted with coconut palms. But the peaceful view belies the reality of where we are. 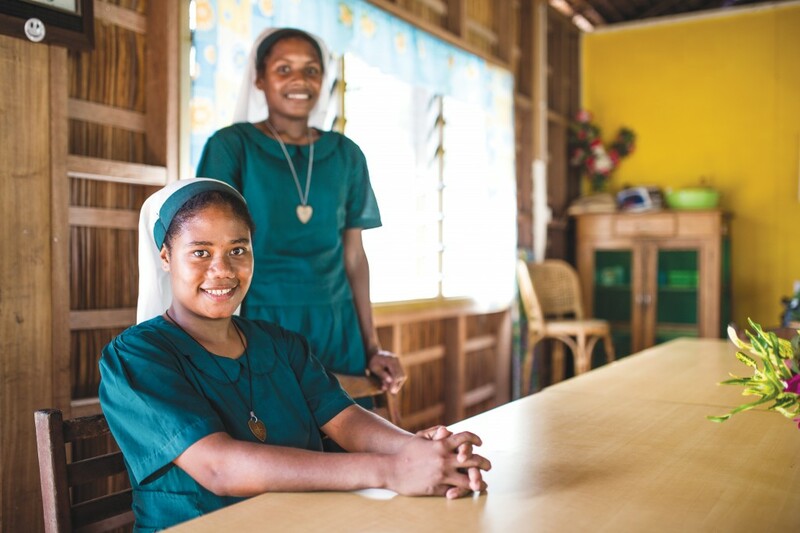 Inside, we meet Sister Christina, who volunteers here full-time with the Sisters of the Church of Melanesia in exchange for a bed, food and basic living expenses. She explains to us that the Christian Care Centre was designed as a place where dedicated care and rehabilitation could take place in privacy and safety. Women and children stay for anywhere between a few days, to a year, or more if necessary. At the moment, it is the only refuge available to women across the Solomon Islands. As we sit and chat, Sister Christina shares stories of the women and children who’ve come through their doors. From women beaten by their husbands to a young girl abused by her cousin, the Sisters have seen it all. In a sense, the Christian Care Centre is responding to gender violence after the horse has bolted. Channels of Hope is trying to prevent gender violence from happening in the first place. Later in the week, World Vision takes us to the Sun Valley village in Honiara where the Channels of Hope programme was piloted in the Solomons three years ago. There we meet Fred Sikini, a 45-year-old village chief. Fred shares openly with us about the way he strayed from his faith as a young man, drinking and partying with the wrong crowd. He says it affected his marriage, which quickly became violent. “I was an abuser. I was a violent man. I drove my car very fast. Other people saw me as a negative, violent man; my own children were scared of me,” he says. Part of Fred’s misunderstanding around gender was due to his own abusive childhood, but it was also a product of culture. In the Solomons, men pay a sum of money to a woman’s family to marry their daughter. Fred said he thought because he’d paid such a large amount of money for his wife, he expected her to do everything he wanted, which led to violence when she didn’t. “I used to regard women as below, because we buy our wives,” he told us. But then he was invited along to Channels of Hope. “It took me through the stages of ordered creation, disordered creation and reordered creation. I realised all my problems came from the disordered creation. It’s a story repeated across the world where World Vision has run Channels of Hope. Due to its success, the programme will be rolled out in other Pacific nations, including Vanuatu and Timor-Leste in coming months, where similar problems are encountered. The hope is that the transformation seen in Fred’s life will be experienced by thousands of others. Sophie travelled to the Solomons as a guest of World Vision.